Post aviation questions on this page that are NOT specific to QF32. We cannot guarantee that all questions will be answered. Are you going to fly Singapore-Sydney tomorrow? Seems like you are flying London to Singapore right now! QNH is designed to be at the cockpit level if i am now wrong. How is that there is 31ft difference during approach for A380? How could i send you pictures i took with you at Singapore Airport after QF2 journey? The 31 foot difference is the difference between the pilot’s eye height and the wheel height (radar altimeter height) during a 3 degree approach to land. QNH is the name for the altimeter sub-scale setting to obtain-read the airfield elevation when on the ground. (ICAO, e.g. Doc 4444: PANS-ATM and Doc 8168: PANS-OPS) So QNH is is not linked-related to any other elevation (i.e. runway thresholds, tarmacs, wheel or pilots’ eye elevations. In fact, the elevations at the later could vary substantially at hilly airports. So even at airports with undulating surfaces and high and low cockpits, the altimeter will always display the one (airport reference) elevation. Rich are your still flying the A380s? Absolutely. Flying to London today – and still loving it! I just finished reading your book, QF32. This is a very inspiring story. I applaud you and your crew. My next book is about Big Jets and will be out in 2021. It was an absolute pleasure to meet you and to be a passenger on QF2 from London to Singapore which you captained on 14th March 2019. This is by far the longest and the best A380 experience i ever had so far. You made the right decision to replace the bearings, front wheel & brakes before take off from London Heathrow and I congratulate you and your team on behalf of all the passengers on board the aircraft. The journey to Singapore on your flight was very smooth. The landing is the best I have ever experienced on an A380 so far. I would like to also thank you for giving me the opportunity to see inside the A380 flight deck which was a wonderful experience. I have a question for you. How do you obtain the QNH value to be set for the particular airport before landing? It was our pleasure to have you on board our A380. I regret the delay but I agree with you that the brakes, wheel and bearings needed to be changed (on one wheel station) before we departed. The QNH is an altimeter setting that causes the altimeter to display the correct altitude above sea level. The QNH changes as the atmospheric air pressure changes. The air traffic controllers use the radio and datalink to transmit the QNH setting to pilots in ATIS & METAR reports and TAFOR forecasts. Here is a question for you. Is the QNH designed to have the altimeter read the cockpit elevation, or the wheels’ elevation or some other elevation? On the A380 there is a 31 foot difference between the aircraft wheels and the pilots’ eye heights during the approach! Thank you for your welcoming reply. If I am right. QNH is designed to have the altimeter read at the cockpit elevation. Could you please explain how does 31ft difference on the altitude occur on A380 during approach? Also, Can I send you my photo taken with you at Singapore after flight journey? What do think about the A380 ceasing production in 2021 due to low orders, cancellations and more small efficient aircraft such as B787-9, B777-9 and A350? Personally I’m very sad about it as I prefer the A380. I am very sad about the decision to stop production of the A380 in 2021. Matthew Orchard – Airbus Wing Factory. These people (and perhaps 100,000 others) are great, dedicated and disciplined people who put their hearts and souls into the A380 project over many decades and produced an aircraft that is remarkable as, and will be remembered with the same passion as, the Concorde. 10 years too late to have 4 engines (2 engines are cheaper to buy & maintain, less drag, simpler aerodynamics). 10 years to late to have 25% composites (new acft are 50% composite). 10 years too early for a large aircraft handle congested airspace and airports (small aircraft will be too small to operate efficiently in saturated environments). 10 years too late for the last generation engines (8:1 bypass ratio versus 15:1 today). The A380 has been disrupted by smaller more fuel efficient aircraft (A350, B787). But in a positive twist, Airbus have disrupted itself. The Airbus A380 has been disrupted by the Airbus A350. So airlines such as Emirates, BA and many others are swapping A380 orders for A350 orders. So like Amazon and Apple (the two largest companies in the world), Airbus has disrupted itself and kept control. Don’t panic. The A380 are not leaving our skies soon. The B52 bomber first flew in 1955. It is programmed to have a 100 year life. So the B52 is scheduled to fly until 2055. There will still be parts, servicings and maintenance operations for the A380 for decades to come. The A380 will continue to fly for at least another decade. (Hint: any airline that is refitting the A380 probably has a financial plan to fly the aircraft for another decade). So Patrick, I am sad to see the aircraft that I (and its passengers love) stop production. As I wrote in FLY! at page 269, I will close my flying career in the A380 ands will cherish every flight until then. However when I retire at age 65, I will then have to disrupt myself and move into another career (that I am preparing for now) – robotics. I am going to build robots that people sleep with. My robots will keep company with the elderly and stop them becoming lonely, depressed, still (dissolving bones, atrophying muscles), isolated (cognitive decay), sick (increasing stress and decreasing immunity). My robots will stop the elderly dying early. We are all being disrupted personally and corporately. Disruption is the new normal. So learn how to manage disruptions, change, risks, decisions, fail fast and fail well. Everyone needs these skills to survive personally and corporately. That’s why I wrote FLY! – the Elements of Resilience. I’ll write more about disruption and the A380 in future articles. This topic will be as relevant for you as it is now for Airbus and me. First of all, I am part way through reading ‘Fly!’ and so far it is probably one of the best books I’ve ever read. Second of all, after reading (and thoroughly enjoying) QF32 multiple times, I decided to write a play on it. I’m part way through writing the script, and you are welcome to view it. I am hoping that the play will be able to be used for my school’s production in a few years time (probably about 2 years due to the way the production schedule runs), and if that doesn’t happen, I and some friends will make a movie on it, that we will most likely publish on YouTube. For this to be as accurate as possible, I would love it if you could have some input in this. Feel free to have a read through the script and use the built-in chat function to let me know of anything you would like changed. Supersonic commercial flight. Will there be a viable future need or demand for it? What are your thoughts here Richard? The most viable is flight below 60,000 feet (so the crew and passengers do not need to wear pressure suits). It was massively over winged so it could land slowly at conventional airports, so was a fuel guzzler. What is your new book Phoenix about? “Phoenix” is a working title. The final name has not been decided. It will be out in September. It’s been a massive task and I am happy with the progress. It’s currently being cut from 240,000 words down to 80,000! I’m guessing you’ve heard of the recent AF66 incident. I am an airline enthusiast and just found out about it today when FlightRadar24 sent me a notification saying that the engine is on its way over to Europe as I’m typing this for investigation. QF32 even got a mention in one or two of the news posts. Déjà Vu! Q1 – What do think of Singapore Changi Airport? A1 – Fantastic airport, great facilities and friendly staff. Q2 – Which do you you prefer – Dubai International Airport or Singapore Changi Airport. A2 – The Aviation industry needs both airports to act as hubs to the world. Both serve similar functions in different areas. So I have no preference from an operational perspective. 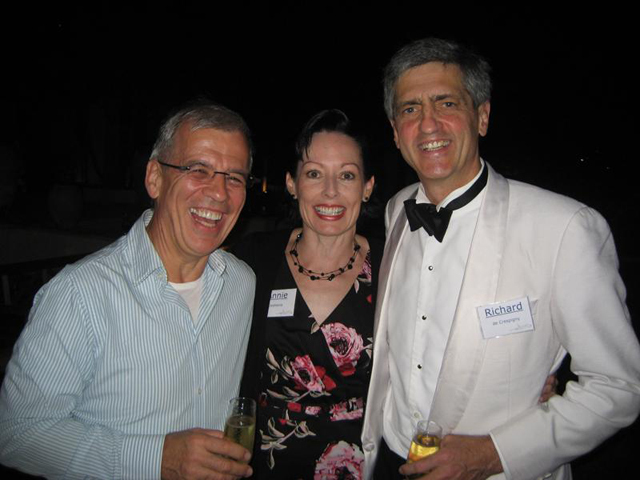 Richard, hope all is well at your end. I had a technical question. Although I have heard no software is 100% bug free however it is my understanding that the software that flies the aircraft including that controls the navigation etc that software has to have ZERO errors or be bug free. Its also my understanding that almost all aircraft accidents that happen are result of mechanical failure and human error. Is my understanding correct? The software that runs on Flight Control Computers (FCC) on today’s aircraft cannot ever be proclaimed bug free, because there are no methods to prove them bug free. The modern FCCs run many programs including many control laws (kinematics), environmental, warnings, protections, aux functions, even in Airbus’case – accessory software such as “Brake To Vacate”. No software exists to provide the full range of options to debug complex-complex systems. Automation is only as reliable as the environments they operate in. Automated systems are reliable because the environments are reliable. When the black swan occurs and the automation finds no applicable case statement, then it turns of, fails or hands over to the creative and adaptable human. Fully automated systems will fail. Tesla cars will probably continue to crash. The RISK of dying in a Tesla car will probably though be less than the risk of dying in a manual car. Everything I write here only applies to the current generation of mediocre and simple serial processors. The game changes over the next 20 years as parallel processors modelled on the brain and networked like the borg take knowledge, sensors, thought and actions to “multi cloud” dimensions. My next book on resilience (due within one year) looks at skills needed to survive in a disruptive world. My thoughts: The weight saving is actually a lot more than just 796 kg (or 8 additional passengers) of weight change. The weight saving on the outer wing reduces the wing bending moments (that reduces the required wing weight) and thus increases the max landing weights. I thought no reversers was also due to danger of FOD as outboard engines too close to runway edge. I’ve only had two flights on A380, very quiet. Very interesting wing twist during turbulence. Does it help unload? How does the A380 load management compare to to L1011-500 active ailerons? The center of the A380’s outboard engines have a ground track of 51.4m. That’s fine for (modern) CODE F airports that have 60m wide runways. However the 2.95m diameter fans in the outboard engines overhang 45 metre wide runways at (older) CODE E airports. Airbus has a procedure (that delays high thrust during takeoff until 40 kts) that is used when taking off on “runways and shoulders” that are narrower than 58m. This procedure is used successfully at (legacy) CODE E airports that have not stabilised their runway shoulders. I am not aware of any A380 engine being damaged by FOD on takeoff. Passive – (Up to 15° symmetrical upward aileron, and outer spoilers if > (220 knots & 1.7g). Elevators correct for aileron and spoiler displacement. Active – relies on 6 accelerometers in the outer engine pylons to command up to 7 degree of aileron deflection to dampen wing bending modes. Wings purposefully twist and bend during turbulence to unload stress, prevent flutter and overstress. My friend Frank Ogilvie told me wings on modern commercial aircraft are designed to never fail in turbulence (if operated in envelope speeds). These wings twist and bend to unload lift as the load increases. Frank was the Aerodynamics Director and Deputy Head of Overall Design for the A380 project through to its certification and production. Landing gear support lug inside the A380 wing. Captain Richard, I’m Chris and I am an aspiring pilot from Indonesia! I bought your book at Changi Airport as I was about to go home and I must say, your book really showed me not just what it takes to be a good pilot, but also what it takes to be a good person who should always improve and learn. I have a six month break before I commence my study to become a pilot in February next year. If you were in my position, what would you do to spend the six months productively? What things would you recommend I do to prepare me to become a pilot during this period of six months? Please read this Christian, I wrote it for you. Best wishes joining the ultimate profession. I’m doing a speech at my school about someone in Australian society who demonstrates the values of teamwork, leadership and initiative. I decided you were a great choice as you showed these values when the engine exploded on QF32, but I would like to ask you two questions on these values. 1. How did you obtain these values? 2. What experiences shaped the person that you are today? Josh I hope you have read my book, as I THINK the answers to your excellent questions lie in the text, especially the answers to Q2. Q1 – How did you obtain these values? Your values are the reasoning engine through which all your awareness, thoughts and actions pass, that in turn determine your outcomes. Your values form your “WHYs” – why you do the things you do. Your WHYs form the impressions that other have of you. Your values determine the trust and respect you have for others and the shared trust and respect they inherit into their teams and for you. starting from an inherited foundation from the sum of your parents, their friends, peers, mentors, school teachers, managers, leaders and the people you respect. adjusted by your knowledge (reading, study ..) into humanity and life. adjusted by your experiences, failures and successes. adjusted by your passion, compassion, empathy and respect for everything that we see, touch and love for our short leased-time on planet Earth. I discovered my values became clear, simple and logical after I was able to answer the tough scientific-philosophical questions of; “Why are we are here?”, “How did we get here?”, and “Why must we die?”. I am an empirical sceptic, so my answers to these questions are based in fact – not rumours, fears, superstitions or beliefs. When you are at peace with the answers to these three questions, then your values become genuine, from which everything flows effortlessly, confidently and logically. No one can set-force your values. However when you can explain your WHYs, that’s when you become authentic, you will influence people who will trust you, you become a true leader, and people will follow you. Thank you for such a detailed and quick reply. Your book was brilliant to read and I thoroughly enjoyed it, I shall look over it again for Q1. Richard have you flown over Iraq ? Hundreds of times, though not recently. I have just completed reading your book and enjoyed it immensely, but what really stuck out for me was the mention of your Father, Peter. I knew his name from when I used to work in GA and when you said that his aircraft registration was VH-SOI I made the connection. SOI was in Nicholas Skyways hangar Moorabbin in the early 80’s. At the time I was subcontracting there as a LAME. I did in fact do some of the maintenance on SOI (You might possibly find my signature in the log books). I looked through some of my old photos and I have found one of SOI in the hangar at Moorabbin. Interestingly your description states SOI has a three bladed prop. My photo clearly shows a two bladed prop, I assume it was changed later on. If you interested I can send you a copy of the photo. I don’t know if your father would remember me, but I do remember him wearing his flying suit and he was always a gentleman who obviously enjoyed his flying. You have clearly paid great attention to my book! Yes your information gels exactly with Dad’s aircraft. He still has SOI and yes, he installed a 3 bladed prop about five years ago. SOI is now hangared in Benalla and Dad, at 90 years of age still flies as often as possible. Back-story QF32 p 009 – War Stories – from School! I have read your book, QF32 and found that the a380 is such a remarkable aircraft so I have a question: How long will the a380 continue to be in service with QANTAS? Have you ever had to deal with violent passengers on any of your flights ? I was wondering why Qantas choose Rolls Royce engines over Engine Alliance engines for the A380 considering Qantas favours GE over Rolls-Royce on the A330 767 744ER and 787 fleet? Have you ever flown an EA powered A380 and if so what is the difference from a pilots point of view if any? Thanks. I have studied the General Familiarisation Course (GenFam) notes for both the Engine Alliance GP7270 engine and the Rolls-Royce Trent 900 engines. Both have the same (within 10 millimetres) (2.96m) fan diameter and (3.15m) engine diameter. EA engine is a 2 spool engine, so is longer and at 6.8 tons is 0.5t heavier than the Trent 900. The EA engine has an excellent vibration monitoring system to monitor and report fan blade vibrations. Engineers use this data to put weights onto the fan hub at a certain location to cancel out vibration (no flight test needed). This method is so accurate that the logic in the monitoring software had to be reprogrammed to accept that a vibration reading of zero did not automatically imply a sensor failure! Both the EA and RR engines have a planned life of 25,000 hrs, cost about $US20m each to buy and each about $US200 per hour to maintain. The EA and RR engines have different engine struts, so changing an engine types would be very expensive. Middle East airlines have the greatest problems with these types (quad engined high bypass ratio) of engines as the high pressure turbine inlet temperatures approach their (EGT margin) limit temperatures (blade creep) and the sand abrades the compressors and turbines. To give you an idea of this problem, the engines in the Iroquois helicopters that I flew in sand storms in the Sinai Desert lasted 30% of their lifetime at home. The bladed disks in the Blackhawk helicopters that flew in Afghanistan had a lifetime of 800 hours in Afghanistan versus 5,000 hours at home. The HPT blades in the jet engines for the Middle East airlines that fly in sand and dust storms last 50% as long as the same that operate in dust and sand free environments. Thank you for such a quick and detailed reply. I just read this article that Tony Hughes wrote about you. It made a bit of an impression on me, hence this email. I’m a 23-year-old software engineer and I’m in love with what I do. One of the things it takes to write great software is great teamwork, and there have been times when people have looked to me as a leader. Unfortunately, I’ve never felt like a “natural leader”. If I’m getting better with time, it’s all from learning and practice. Tony Hughes writes that you had effectively transformed 440 passengers into the best PR and brand agents that management could have ever hoped for. I read about what you told passengers in the terminal, and it sounds like you went beyond just reassuring them. You won their hearts. How do you come up with what you said? Do you have to think about it much beforehand? How much did you draw on past experience? Sometimes I fear that great leaders aren’t made, they’re born. How much do you agree with this? What were you like when you were my age? I don’t know what I don’t know. Is there anything else you really want to add? Thank you for these questions. I presume you have read “QF32”. I am often asked why I gave full and open disclosure my personal guarantee. The full abstract answer is quite long and so I have put all of this into my next book out in 2017. Great leaders are definitely made, not born. There is a chapter on this in my next book. I’ve read and re-read your book several times. Thank you very much for your contribution to this world, it has been an inspiration to me. Since I was a little kid, I have always been in awe of Pilots and their abilities and without ever having met you, I am in awe of you as well. I know that I do not have what it takes to become a flying member of your industry, monetarily and intellectually. My obsession with aviation has never really left me however, so at age 30 I decided to still study towards the field. I am currently studying the Bachelor of Aviation. I would love to know, (if you happen to know) more about non-flying and the aviation sector. I read your blog, but I thought if you know of how I can expand my knowledge, that would be wonderful. I’ve flown as a passenger on many different aircraft including the A380 and I’ve been puzzled by something that seems peculiar to the Boeing 777. As the aircraft prepares to leave the gate, one engine starts up and the sound of the engine increases in frequency and magnitude to the point where it becomes deafening in the passenger cabin (economy section) and goes through some kind of resonance peak with associated vibration of loose items in the cabin. As the engine speed continues to increase, the sound magnitude decreases. The second engine then starts up but the sound magnitude does not go through the same resonance effect. This has happened without fail on eight out of my nine 777 flights during the last 4 years. On the ninth flight, there was no such resonance effect during engine start up. From the book QF32, you mention that you did not fly the 777 but you knew Captain Peter Burkill, who did. Perhaps you know other people who have a good working knowledge of the 777. I’m wondering if the 777 engine start up has such an acoustic signature. If not, would it be something to be concerned about? Does the cabin crew ever report or provide feedback on such observations to the pilots? Do passengers have a way of reporting such observations to the pilots or airline? Thank you for the many lessons that have been and can continue to be learnt from the QF32 incident. The engine vibrates during the period it revs up to idle during start. The vibrating engine causes amplified harmonic vibrations in the fuselage and cabin. Hard metal-metal bearing contact until “oil squeeze” is established. Combustors are very noisy during start, when the airflow is unstable, pressures low and the flame front is thus unstable. It’s a challenge to keep the flame from surging forward from the combustor into the compressors. Frank Whittle (the inventor of the jet engine) needed Shell’s help to stabilise the flames and get his first jet engines started. Most engines increase the air/fuel mixtures during start to reduce noise. The engine also vibrates during start due to hard metal-to-metal contact between the casings of the five main rotor bearings and their bearing housings. There is a 10 thousandths of an inch gap (0.010″), half the size of a gap in a spark plug, that separates the outer race of the bearings from their housing. 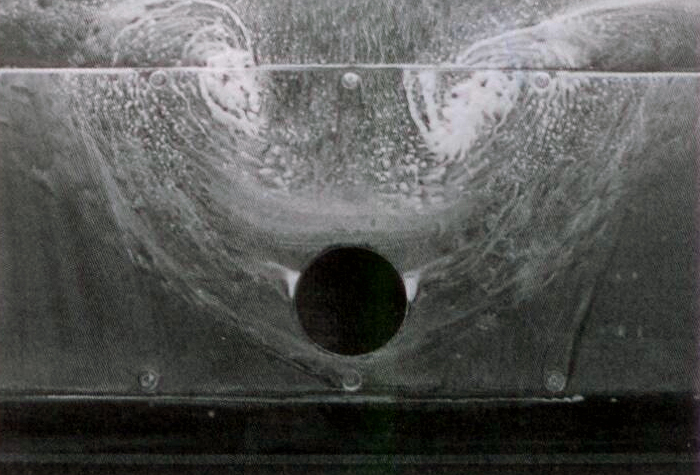 The gap is filled with pressurised oil provided from the main engine oil pump that is driven by the inner (N3) rotor. This oil film is called a “squeeze film” that keeps the bearing and housing separated and absorbs tiny vibrations. The minimum operating oil pressure for a Trent 900 is 25 psi. I imagine the vibration will occur from the start of the engine start until the pressure is enough (about 60 psi at idle) to lift the bearings off its housing and maintain the “squeeze film”. Note: The 777s you flew probably had GE (GE90) engines. However my airline uses GE (CF6) engines in our A330s that have “squeeze films”, so the logic probably applies to the larger GE engines. Each US$20m A380 engine is fitted with an EMU located next to the US$1m Engine Electronic Controller computer (EEC). Each EMU monitors 100 engine parameters every 5 seconds, with the aim to produce novelty reports and predict failures. During the QF32 event, the #2 engine EMU data was available for the flight duration, until 3.4 seconds after the engine failure. A lot of this data was immediately transmitted to Rolls-Royce after the explosions. The novelty reports are very effective. In my airline, I calculate that at least 50 engines are changed (before they fail) for every engine failure. I’ll try to get a photo of the RR operations centre, that has one 30m wide wall of monitors showing every RR jet engine that they are monitoring, overlaid on an enormous Mercator map of the World. Philip, the vibrations you heard and felt are normal. If your airline subscribes to the engine manufacturer’s monitoring services, then you do not need to be concerned or report the vibrations. I have delved into higher details in this answer to show you just one example in aviation where monitoring, reporting, predictive maintenance, communications and alerting systems all come together to provide the remarkably high level of safety that we take for granted. This information is not common knowledge, but it all contributes to resilience. When we take effort to learn the fine details, then we are better prepared for the unexpected. You have picked my interest. I’ll update this page when I locate a (side) noise signature for the GE90 and RR Trents. Take-off noise – that’s an entirely different beast. The “buzzsaw” effect is a remarkable topic for another time. Buzz Aldrin in 2016 checking my data for Phoenix. I understand Qantas will be phasing in Boeing 787-9 Dreamliner aircraft in approximately 2 years or so. I was curious if you have given any thought to piloting this aircraft? From reading your book, I recall you saying how exciting (and challenging!) it was to be one of the first Qantas pilots to fly the 747-400. I have flown the 787-9 twice and think it’s a brilliant aircraft. So quiet and it seemed to glide rather than bump through turbulence. It would be a shift going back to the yoke after flying the sidestick in the A380 for a while. Keen to hear your thoughts. I flew the 787 simulator at Boeing in Seattle. I was very impressed by the protections, handling in direct law and advanced flight control laws. I will pass on flying the 787 professionally. I have always strived to fly the biggest, fastest and most advanced aircraft. The 787 is a lot smaller than an A380. The 787 however is a remarkable machine and I am sure pilots will love flying it. There are benefits in having a pair of locked yokes (AF447), and great enjoyment in flying with sidesticks (though they come with a conscious educational and mental overhead). Pilots no longer directly control the flight control surfaces in Boeing and Airbus FBW machines, so the choice of aircraft is more complex than just personal preference. QF32 book, best book I’ve EVER read! Congratulations and thanks. In 1997 I was at Arthurs Pass, New Zealand, I saw a large plane going west, in fine weather. I could clearly see the Qantas design on the tail fin. I wonder how low the plane would have been flying? It is so close to the mountains of the Southern Alps, giving the passengers a really fine experience? I recently purchased your book QF32 and I’m already reading it for the second time. First time I was finished in just two days! I simply couldn’t wait, because it really captivates you and you HAVE TO read it. It is a hard thing to read due to the amount of information provided, so I found myself reading several things again and again. I like your style of writing, it is very similar to mine – I write novels as a hobby. As a result, I’d like to ask my first question. I am a very sensitive, caring, emotional, people-oriented person. Many say, I tend to dramatize too much and that I take things personally. So, I was thinking of writing something connected to the QF32 event. The idea is making the plane “alive”. The story would be kind of personification of VH-OQA and what happened on that remarkable day through the aircraft’s eyes. If this is not just a silly fulsome idea for you, let me know and I’ll post it here as soon as I finish. Q1.) In your book, you mention you were running a half-marathon on the day of Nancy-Bird’s delivery to Sydney. How do airline companies decide, who will bring a new aircraft home? Can pilots apply for something like this? A. The first deliveries are always “political” decisions. Later deliveries are handled by technical pilots and occasionally, to those for good deeds done. Q2. Have you flown Nancy-Bird after that faithful day? Does it ever bring you memories back or the fear, that something could go wrong again? Do you ever meet with other pilots from that day and discuss your experience? Q4. Do you personally like to discuss experiences with other pilots and share your knowledge not only of the QF32 event, but events from your whole career? Do you like getting lessons from others? Generally, do pilots like this or do they think, it’s enough to use company’s manuals? A4. We talk about all our experiences, training and knowledge. Q5. I guess, this varies with airlines, but is it possible to have a cockpit visit while on Qantas flights? Do you allow it during take-off, flight, landing or afterwards? 6. What is your definition of a good pilot? Does a pilot need to go through some catastrophic failures during his flight to prove himself? How do you determine somebody as a competent, if nothing significant has ever happened on flights under their command? A6. Wait for my next book! Q7. Do you interact with pilots from other companies? Do you ever meet international crews during layovers? Sorry for the long post, but I am really interested in aviation as a layman and you always give remarkably good and detailed answers. What would be the minimum maneuverable speed where the A380 can sustain leveled flight at very light loads? In this case the whale was a at minimum altitude of 4000ft and ranging between FL040 & FL060 – holding by at two fixes along the Dubai coastline. Is it too dangerous to fly close to such speeds that are just in the “red zone” or flight stall speed? Unrelated to the above, can an aircraft landing gear be deployed much earlier to compensate for speed at a high descend rate while on the glide slope even after flaps to 1 and speed brakes are halved? I am very impressed with the DubaiX video. The core of the wing tip vortices would have been deadly for Yves Rossy. These were located close at the wing tips, then trailed behind and below the wing tips. They are also invisible in clear air. The wing tip vortex at each wing tip would be like a tornado that is lying on its side with the bottom of the tornado attaching at the wing tip. The pair of vortices (from both wings) trail, spread and descend down to about 1,500 feet below the aircraft before breaking up into many smaller vortices then random turbulence. If Yves positioned just outside the core away from the wing tip, then he could have surfed (requiring almost no thrust) on the air rising in the enormous vortex. The A380’s approach speeds are all published at the back of QF32 for maximum and minimum landing weights. The pilots’ air speed indicator shows a yellow Vls (Lowest Speed) index that is the lowest speed that the auto thrust can be engaged. This speed is 1.23 times the Vs1g (stall) speed. This is a safe manoeuvring speed with good (0.5G) margin to the stall. I imagine a good precautionary and manoeuvring configuration for the A380 would be FLAPS 2 that has almost full (20 of 23 degree) slats, moderate flaps (17 of 32 degrees) and 5 degree Aileron Droop. The aircraft could comfortably manoeuvre down to 160 kts (that is well above Vls). The crew would take FLAPS 3 or FLAPS FULL if more slats-flaps are needed. In this case they could comfortably manoeuvre down to about 140 kts. Landing gear can be deployed below FL210 if slower than 250 kts / M0.55. My congratulations to Emirates for a well planned and risk assessed flight! 1) This is regarding the AutoBrakes (AB) on the A380. Is there an actual difference between the new AB system adapted to the A380 called BTV or Brake To Vacate as compared to the standard Airbus AB on older A380’s which have the inputs that range from “LO-2-3-HIGH” or the typical “LO, MED, MAX” as found on the family younger A33X and A32X series. On an recent upfront visit to the deck of an EK ship, I found the AB switches to have “BTV” selector as opposed to the “Disarm” found on some other A380’s. By work function, does the BTV system do any different than the standard AB option on other A380’s or other Airbus aircraft’s for that matter? I don’t have a much understanding of the Airbus AB operations but I’m assuming it’s the same as done in Boeing aircraft; like the B777, where there exist a landing performance computer or OPT where it computes the data and gives you optimum information regarding the deceleration and respective AB settings for rapid exit points (like K8 or K9 in Dubai for 30L approach). It’s just fascinating to learn about new things and keep digging just to find out how complex and advanced aircraft’s can be. 😀 I hope my questions weren’t too stupid or asked before. All A380 have a switch detent to select BTV, but the computer pin selections determine if the PRIMary flight control computer software is enabled. BTV initially cost $250k per aircraft. I understand the cost has reduced to $90k per aircraft. BTV will only provide a reduction in insurance costs for airlines that already have a marginal safety record. BTV’s variable autobrake slows the aircraft to vacate the runway at desired taxiway at the desired taxiway speed. BTV will autoselect a subsequent taxiway if selected taxiway not possible. In case of float, a new BTV option warns pilot to go around in case the aircraft cannot be stopped on the remaining runway. I do not think that BTV achieves anything more than what a normal pilot could achieve on a normal day to slow and exit the runway at a given taxiway. However I think the Runway Overrun Protection (ROP) is a great feature that in light of previous accidents, offers great safety benefits. The A380s Autothrust (A/THR) is exceptional. There is no operational reason to conduct manual thrust operations on the A380 other than to practice in case of A/THR failure, or to build general confidence. I conduct manual thrust landings whenever possible. In practice this means that I conduct manual thrust landings for about 30% of my landings. 2). Do you think Rolls Royce are held responsible for the incident? YES. THEY ACCEPTED RESPONSIBILITY AND HAVE MADE ALL ACTIONS OF RESTITUTION. I HAVE THE HIGHEST RESPECT FOR ROLLS-ROYCE AND THEIR ENGINES. 5). Is it true that the stub pipe that nearly brought down the A380 is 5cm long? YES, AND A LOT OF BAD LUCK! Thank you for you time again! I have recently finished your book QF32 and I’ve really enjoyed it. I just have a curious question regarding human factors/ human performance in the cockpit. I was wondering if the general public’s or expert thoughts on QF32 would have been different had First Officer Matt been piloting the plane instead of you? I only ask this question because I’ve recently finished reading all the books written by the pilots in the airline industry that I really look up to [You, Captain Sully (US Airways Flight 1549), and Captain Peter Burkill ( BA Flight 38)]. I’m no professional in the airline industry, but through countless episodes of “Air Crash Investigation” and watching interviews on Youtube, I’ve learned that a pilots first actions in a time of crisis is to Aviate, Navigate and Communicate. Through all three books that I’ve read, the incidents (human factors wise) of BA flight 38 was one that came under severe international scrutiny, hence my curiosity for the above question. Thank you so much for taking the time to read my comment and I wish you well. I would have taken over the flying duties from Matt if Matt had been flying. The pilot flying has more spare time to manage the many teams in an emergency. The pilot not flying is focussed and preoccupied with ECAM/EICAS. Captain Peter Burkill made a very gutsy but as it turned out, the right decision to raise the flaps one notch prior to landing. I wrote about my reasoning for this in my book. The pearls of wisdom in Peter’s book comes from analysing the questionable responses by nearly every agency towards Peter and his family after the event. In this regard, “30 Seconds to Impact” is your best guide for what to avoid after a crisis. I will write more about this in my next book. Q1). Do all aircraft have hydraulic fluid? Q2). For take off, does the pilot in command put the thrust levers forward or the co-pilot? A2. The pilot FLYING the aircraft has control of the thrust. The pilot flying could be the PIC or the co-pilot. Q3). If you fly VH-OQA a lot, then does it feel weird to be in same aircraft again since that aircraft was in the incident? Q4). Do pilots prefer to fly Boeing aircraft or Airbus aircraft? (Since all Airbus aircraft have a side stick and no Boeing aircraft has the side stick). A4. You will have to read my book for that answer. Click here to order. I was in the flight TK 1767 (Istanbul to Prague), but there was a turbulence for hours. Can you please tell me why flying in these areas can occur a long turbulence and how’s your experience of controlling the aircraft with long turbulence? P.S: Are you still a pilot is Qantas Airline? polar jet streams that form at the meeting of the polar and ferrel cells. This the change in the tropopause height can vary by 15,000 feet, causing a fast polar jet stream and LOTS of turbulence. Sorry to be technical but you asked! 1. Apart from good pilot flying skills, what attributes do you believe are required of a pilot in a successful airline ? 2. What makes you want to work for Qantas rather than other airlines ? 3. What makes you want to be a pilot? Sunny these are good questions that are all anwered in my book QF32. Hi Sunny I recommend if you are looking for answers to the airline application questions that you answer from your own thought process and experiences. Good luck on your application. Hi it’s me again, hope you don’t get annoyed from so many posts of me, but i’m really interested in aviation and i love your answers. Q1.) Before you sent Mark to inspect the damaged engine, did you in any moment think of possible causes and damage or what’s happening at all? Or did you simply focus on solving the problem? A1. Don’t presume or assume. Focus on the facts! Q. I got a feeling that the whole time during the emergency, you were confident about a positive outcome. But were you? A2. Yes. I never thought about my family. I didn’t know how I was going to land, but I knew we would be creative and work through all the problems. Q3. No fuel dumping or transferring was available, but why was that? We know, the left wing had mayor mechanical damage and there was some wiring cut to the right wing. How comes that there wasn’t possible to dump fuel from right-wing tanks at least? A3. Fuel computer logic was inappropriate (almost useless and impossible to understand) for the given failures. 1/2 fuel pumps failed. Both transfer galleries cut. Jettison valve broken. 4.) You have such an enormous knowledge about airplanes and flying it’s like listening to an experienced engineer. Have you ever studied aviation engineering? If not, what school have you finished? A4. I’m a BSc. If I had my time again I’d do mechatronics (my passion today). 5.) Qantas has some european routes via Dubai. Which ones and how often? How is it with crew scheduling? Do you fly to Dubai first, have a layover and then fly to London for example? Or do you fly do DXB, have some days there and then proceed to Europe? My thoughts even go to possible cabin crew and pilots based in Dubai. 6.) Which routes from all that Qantas has, are you favourites/least favourites and why? 7.) I read a lot about people saying, that you never fly with same colleagues. It can happen, that you fly for 10, 15 or more years and then one day, you happen to fly with people, you’ve never met before. Why is this? My dad is a long-haul bus driver and anytime the rule says, there have to be two drivers because of the amount of driving hours within 24 hours, he likes to cooperate with people, he knows well and knows about their abilities, knowledge, how will they react in a critical situation and what can he expect from them in general. I told him about this rule in aviation and he can’t comprehend it. A7. There are 2,400 pilots in my airline. I fly 70 sectors a year. QED. Sorry again for nagging you and hope you don’t mind any further questions. I dare to write so much because i got a feeling that you love to talk about anything connected to aviation. The QF32 event was a real black swan event, like you use to stress many times in your statements; the aircraft seemed to have endless failures and after watching the aircrash investigation episode of this event many times, I still hardly understand how is it that the plane did not crash. There was almost nothing left after the engine explosion. Well, I have to correct myself – there was you and other pilots. I’m still speechless. It was an extraordinary demonstration of huge amount of skills and airmanship from all of the five pilots, it’s just..wow hats off. I’d like to ask something. Harry and Dave were check captains, which were not supposed to have any decision-making authority during the flight to Sydney (correct me if i’m wrong). I understand, that after the explosion, you and Matt were extremely busy and needed some additional help, so Dave was called into action. But why him? Why not Mark? I’m not underestimating the priceless data, which he gave to you when he returned from inspecting the engine, don’t take me wrong. All what happened on that day, doesn’t only help other pilots to learn more, it goes beyond flying an airplane. It was a completely unprecedented event, which nobody’s trained for. It was well thought planning and a cohesive team work, that brought the plane and everyone on the board safely to the ground. The skills, demonstrated by each pilot, can be transferred onto several aspects in everyday life and I guess this is the reason, why the whole thing got so popular among general public. In one of your interviews, I heard you especially stressing Michael’s contribution to the positive result; he has indeed done things well beyond his usual responsabilities and that’s why he’s now my big role model for when I become cabin crew, which is my life goal. Thanks again for all the lessons, which I could take from the QF32 event. In addition, I cannot stress enough how many life lessons I’ve got already from reading and hearing your statements, whether they’re directly connected to the QF32 event or not at all. I love your life logic and attitude. I wish you many many safe flights in that left seat of yours. Thanks for your kind comments Petra. Matt and I operated the aircraft as a two pilot crew. This concept ensured that Matt and I each knew our roles and tasks. Dave, Harry and Mark provided extra resources to delegate tasks and monitoring duties. They also provided invaluable input when decisions had to be made. There are no egos in aircraft cockpits. Tasks were delegated to those best suited to complete the tasks. Somebody should make a film out of this amazing story. If anytime in the future you decide to visit a small, uncrowded, peaceful, yet extremely interesting and beautiful country, I’d suggest mine. It’s a tiny European land, south of Austria, called Slovenia. You can come then I will be glad to give you further details and recommendations. I have always been a big fan of Airbus aircraft, from my first ever flight in an A330. I have only had the privilege once to fly the A380, but with emirates. I had a middle seat and hardly noticed the engines spooling to takeoff thrust. You have probably been asked this many times before, but what are your ideas on AF447, the A330 that crashed in the middle of the Atlantic in 2009. I think it is a little odd the pilots of this flight lost control of a perfectly intact aircraft, and you were able to safely land a very damaged A380. I realize also that two 757s have come to grief because of the same problem, faulty airspeed readings. I just think that as the AF447 was descending with a high angle of attack, experiencing low speed buffeting, and the stall warning, that the crew should have at least tried to lower the nose instead of pulling back and hoping for things to happen. There is a trend of new influences appearing in the list of significant causal factors for the AF447 and other many accidents that have occurred in the past five years. These new influences relate to the challenge of maintaining resilience in high risk, mechatronic environments such as aviation, nuclear and exploration industries where “failure is not an option”. The new 4th Generation of automated FBW aircraft are unlike the three older generations of aircraft. This new breed of mechatronic aircraft require a new breed of 4th generation pilots who understand basic mechatronics and who also possess the basic ability to command and hand-fly aircraft. These skills are not being sufficiently trained and maintained in today’s low yield airline industry. Flying isn’t spins and loops. If you want to fly a high tech aircraft that is run by computers, then there is a responsibility to have a deep systems’ knowledge. 4th generation pilots also need the same manual flying skills that their predecessors had. Because when the mechatronics fail, and they do fail, then it’s up to the pilot with his hand-flying (motor) skills to recover a complex aircraft whether it be stalled, inverted, spinning or on fire. ICAO has not kept up with and changed the requirements for airlines and pilots who operate 4th Generation aircraft. Aircraft have changed over the past 112 years: the automation has developed; the fly-by-wire systems have developed and the human-machine interfaces have evolved. However the methods to train and maintain pilots’ skills have not evolved sufficiently and in synchrony with the technologies to prevent the new types of mechatronic failures that we are now witnessing. However, a problem remains: 4th generation design can make hard a 4th generation training. My favorite comparison is Microsoft Windows: You have a desktop, binders, documents and even a trash bin but, if a blue screen appears, you discover suddenly that the whole PC experience is a set of carefully crafted metaphors instead of binary logic and the real thing. Knowing how to better handle Windows won’t solve your problem because you still need to get out of the metaphor. Possibly, you remember the case of Three Mile Island where an important nuclear incident happened. One of the problems was the indicator for a valve. It was showing that the valve was opened…but the sensor for the indicator was pointing to the switch, not to the valve itself and the operator did not know that. That’s the kind of problems that we have now and training is a must. But, perhaps, providing the right kind of training requires a previous condition: Design – real design, not a metaphor about it – should be transparent to the pilot. 4th generation designs require 4th generation operators, knowledge and training. When systems fail, automated aircraft are harder to fly than manual aircraft, NOT easier. Operators of mechatronic systems must have the knowledge, training and experience to work with base data and the many hierarchical levels of sensors and virtual interfaces. The Three Mile Island incident was also a case where the operators were remote and could not “see” the systems that they were controlling. When the senses failed, they had no method to revert to simpler controls. High level graphic metaphors are here to stay. Operators need the knowledge, training and experience to revert to lower levels of metaphors. I also think that pilots should be trained to fly aircraft in worst case instead of best case scenarios. I think also that more and more people would agree as time goes on. Just look at the way Airbus is training new A350 pilots to manually handle their aircraft (in normal and alternate laws) first before getting into the systems management. I’m in year 8 and I love aviation and I want to become a pilot in the future. I recently read your ‘QF32’ book and it’s the best book I’ve seen and read. One day I will like to see you, but chances are, that probably won’t happen because I don’t fly alot. (I’ve only been on a plane once). The air crash investigation and 4 Corners version of QF32 I have seen soo many times. My favourite one is the 4 Corners version because it’s got everyone in it like You, everyone on the QF32 flight, Alan Joyce, Alan Milne and other people. I hope I see you one day to get a photo with you. Hi Emily, Thanks you for your messsage. Airlines needs girls like you to work hard and to become pilots. So read my blog about how to become a pilot and come fly with me! The Boeing 787-900 and A350xwb are both similar type of aircraft. Why some airlines prefer to operate 787 rather than the A350? In your opinion, which one fits the best in airline business in Australia, and why? Personally, I prefer the Airbus side stick to the Boeing yoke. However pilots who fly using sidesticks must receive additional training to understand the threats of dual input, no feedback from the other pilot’s sidestick and aircraft performance. The choice of A350 vs B787 for long haul could be based on trying to keep with one common aircraft type. It should be possible to have A380 pilots trained to also fly the A350. It would make great sense to have B777 pilots also trained to fly the B787. The choice of A350 vs B787 for short haul will probably just come down to the minimum operating costs. Thanks Captain Richard for replying my message, I do have one more question. When landing, why do planes engines ‘get louder’ directly after hitting the tarmac? You are hearing the engines rev up with the exhaust redirected to produce reverse (to slow the aircraft). I am currently in year 10 at school. I don’t get the best marks in maths but try my best and my other subjects are around a B. After I finish school I would like to join the RAAF to become a pilot. As I am coming closer to the HSC I am worrying about how my maths mark will come about. I’ve read on the ADFA website that they look for people that make quick decisions rather than top academic students. Do you know anything about entry as a pilot at the Australian Defence Force Academy (ADFA)? Also, I know for an arts degree that maths isn’t required but is a part of the degree, also for physics. I’m not to keen on the arts degree because of those reasons, not that I can’t do them, but if I don’t do maths and physics as a subject in year 11 and 12 I may find the degree hard. So again, my question is do you know if ADFA would first select people that have done for example the technology degree over the arts degree? I would like to become a pilot but I wasn’t able to study physics at that time. I now read a lot about the aviation industry, especially air crashes. I have a question. Once the aircraft lands and touches down on the ground, the flaps may decrease the effectiveness of the brakes since the wing is still generating lift and preventing the entire weight of the aircraft from resting on the tires, thus increasing stopping distance! Am I right? If yes, then do you have a solution? Dear Mohammad. You are correct. Wing flaps increase the wing’s lift and reduces the weight on the tires when the aircraft is moving on the ground. The braking efficiency is degraded by this effect. The solution is to raise the spoilers on the top of the wing after the wheels touch down. The Spoilers destroy the controlled airflow over the wing and thus most of the wing’s lift. The slotted flaps will still be producing some local lift. However the spoilers destroy the flaps effect of increasing the wing’s camber (and thus wing lift). The A380 has 16 spoilers (eight per wing) to dump lift and act as speed brakes. All six ailerons also extend full up to dump lift and act as speed brakes after touchdown. – full extension afterwards when idle is selected and landing gear oleos are compressed on both sides of the aircraft. Armed with this information, perhaps you can now appreciate why the landing distance of my aircraft was so long for the QF32 event. The antiskid brake systems must have activated to protect the tyres from bursting as we tried to slow and stop. The flaps functioned normally, extending 26 degrees down (80% of full deflection). However 50% of the spoilers and 65% of the aileron spoilers were failed and so failed to dump lift and act as speed brakes. I have a question which I’d love to know the answer for, and I cannot find it on Google. Just supposing someone who has zero experience of flying a plane (me) managed to fly the A380 in an full motion A380 simulator. Is it possible to be injured in the simulator if the pilots do something stupid? The $20m A380 high fidelity simulators are powered by high pressure hydraulics or hi torque electric motors. The simulator will rapidly jerk to simulate aggressive flying (or crashing). The occupants are safe if strapped into the simulator seats. The occupants are at great risk of injury if they are not strapped into their seats. In a freak accident, friends of mine were taken to hospital with spinal injury after being tossed around in a B747 simulator that misbehaved. This is a very rare occurrence! Happy new year to you. Hope all is going good and you’re enjoying the beautiful skies. My question is regarding your command and operations. Does the Captain have the authority to decide whether to fly an approach manually or with the autopilot engaged? For an approach to an airport in conditions of clear skies, light winds and good visibility, does the Captain of a big jet airliner have the authority to decide whether to undertake a manual landing or use the auto-land procedures? I have seen YouTube videos showing pilots disengage the autopilot at about 3,000, 1,000 or 500 feet. The pilot then carries out a manual landing. Other videos show approaches being flown manually from the transition altitude. What are your thoughts about manual flying? The Captain of an aircraft is responsible for the safety of the aircraft, crew and passengers. Every decision is made to achieve this outcome. Autoland procedures are used when the cloud and visibility is below the published minima. In good weather, it is the captain’s decision whether to land the aircraft manually or to use the automatic landing. When a manual landing is conducted, it is the captain’s decision when to disconnect the autopilot and to fly manually. The autopilot may be legally disconnected below RVSM airspace (29,000 feet) on descent. In practice, the decision when to disconnect the autopilot is made by the captain, as a function of the approach type, weather, pilot fatigue, aircraft state, autopilot and auto thrust performance, workload, company policy, pilot preference, ATC congestion, airspace, visibility, wind shear, turbulence…. Pilots must land aircraft manually to keep their manual skills current, just the same as Tiger Woods, Roger Federer and Beyonce practice before they go live. It is impossible to keep the human body’s motor skills at the level sufficient to fly jet aircraft without physically flying the aircraft/simulator. Long Haul pilots who conduct few landings and who in good conditions only disconnect the autopilot late on an approach before landing are denying themselves the opportunity to maintain and to optimize their manual flying skills. In this situation, with the absence of hands on flying in simulators or other aircraft, safety is absolutely compromised when the unexpected happens and manual flying skills are required. Remember, automation is just a tool. Automation often fails. Proficient pilots prevent failed aircraft crashing. In the new generation aircraft, automation has failed in many black swan type incidents where only the skill of the pilot determined whether the aircraft survived. For instance, the recent and remarkably impressive efforts of (I think) Luftansa pilots prove my point. When the fly-by-wire software faulted, the crew operated outside the square, without guidance from any manuals and procedures, made excellent decisions, made brave actions and saved their aircraft. Bravo Luftansa!. I wrote in my book QF32, that pilots must never be afraid or incapable of flying an aircraft at any phase of flight – regardless of the status of the automation, regardless whether the aircraft is stalled, inverted, spinning or on fire. Safe pilots MUST be proficient at hand flying. Any attempts by airlines to limit the amount of manual flying in safe conditions or the simulator should be challenged. Why don’t your A380s have the HUD which I believe is important for commercial large jet flying? A study by the Flight Safety Foundation study a few years ago found that Head Up Displays might have prevented or positively influenced 38% of all commercial aircraft accidents that occurred since the year 2000. The benefit of the HUD benefits increased where the pilot was directly involved, such as during takeoff and landings (69% protection) and loss-of-control accidents (57% protection). Head Up Guidance (HUD) screens for an A380 costs about $250,000. The fit out includes a roof mounted projector behind each pilot’s head, 9 inch square Combining Glass rotates down into place. Specific displays for: Taxi, Takeoff, Flight, Roll Out/Rejected Takeoff. I flew the Airbus MSN#001 at Toulouse that was fitted with HUDs (photos below). I think only Air France has purchased HUDs for their A380s. Help prevent unstable approaches and runway excursions. More time spent looking outside. Refocusing requires about 0.8 secs. So it takes about 3 secs to look down, focus, look up, focus. Cat II minima are possible to a CAT 1 runway in some cases. Most of the airports that host A380 aircraft provide CAT 2 or CAT 3 approaches with Autoland. HUDs provides less benefits when flying at these airports than airports that have no ILS approaches or just a CAT 1 approach. This is the reason that most airlines decide not to fit HUDs in their A380s. The list above shows that HUDs provide more than just the capability to approach to lower minima at basic airports. It is for these reasons that I recommend HUDs for all big jets. The A350 and B787 both come with HUDs as the standard configuration. I just finished reading your book and thought it was brilliant. Thank You for sharing your story. As a Psychology Graduate, I think it’s so important you discussed your PTSD. It’s something too often pushed to the side or silenced. Also very pleasing Qantas provided counselling to the cabin crew. My question is about ranking for airline pilots. On a recent flight on Air Asia (A320 PNH – KUL), I noticed the Co-Pilot sported two stripes. So he is a Second Officer, correct? I was under the impression the Co-Pilot needed to be a First Officer. I can only think it’s because he was a trainee First Officer? Appreciate any insight you can provide. Also the PIC can only ever be a Captain, right? I may be wrong, but on another Air Asia flight (A320) I could’ve sworn the pilot in the left hand seat had three stripes and the pilot on right had two stripes. Perhaps I was wrong? Finally, the last words of your book stated that you didn’t pass your route check on QF32. I’m a bit confused about this part. Was it because you were unable to complete the entire route? Or was there another reason? Sorry if this was already asked. If you were on my A380, then it would be my privilege and pleasure to have my photograph taken with you! An advanced Airbus aircraft can’t simply disappear out in the sky and off the radar without any “distress” call to the ATC. In the case of Air Asia flight, even if it was turbulence or terribly bad weather, there would have been a reaction time for the crew to declare “MAYDAY” or “PAN-PAN” but absolutely nothing! I think 2014 has been the worst year for aviation and all this does is bring more fear to the nervous flyers out there. It’s also sad that cost cutting is more a worry than safety these days, when we have the technology to update aircraft tracking systems, weather radars and improve communication, all the industry does is try and cut fuel costs by improving efficiency. Nearly a 1000 lives this year. No traces of MH370, a B777 jet!! Captain do you have any message for the people who have now become more afraid to fly than before because of these random happenings of aviation incidents? Those people would’ve just been going home to Singapore to visit their family for new year, and this all now ends in tragedy. Why is the FAA and EASA silent? Do you think aliens took the Indonesian Air Asia flight? It’s plausible because a friend of mine told me turbulence cannot bring down an aeroplane. I guess you will have to ask the aliens. If there were aliens in our vicinity, then I don’t know why they would risk the complication of taking an aircraft that is in high speed flight when they could have landed and asked for volunteers. Turbulence cannot bring down modern aircraft if they are flown at a speeds not exceeding their speed limits. Fly by Wire aircraft have active (moving flight controls) and passive (bending wings) methods to dump lift and prevent the airframe from being overstressed. In my book QF32 at page 39, I discuss that we often inadvertently flew our Caribous into embedded thunderstorms (the Caribou did not have a weather radar). Fortunately flight is safer today. If a pilot inadvertently flies into a column of rising air (for example in a thunderstorm), then the priority is to initially maintain a constant cruise attitude and thrust, that will help to keep the air speed stable and within limits. In these conditions, providing ground impact is not a factor, we accept any altitude deviation, no matter how extreme (other aircraft are affected in the same manner). In these situations we would also transmit a “PAN” emergency message to the Air Traffic Controllers to notify them that we are temporarily unable to maintain the cleared altitude. There is a low chance that other aircraft have penetrated into the same thunderstorm in the vicinity. Good Evening and Merry Christmas Captain! Q1. This is something I just recently noticed, a bit surprised by it too. Haven’t paid attention to detail until, I saw this video of an EK A380 landing at LAX. Why does an Airbus A380, the world’s largest commercial jetliner, only depend or rather use only two reverses i.e the inner engines whilst the outer don’t open up? I did try Google, but everyone seems to have different answers for this but on the other hand, the Boeing 747-8 Intercontinental has all 4 operational on landing. Q2. A Boeing question regarding the B787 Dreamliner. Why doesn’t most of the 787 operators prefer using the engine color coating as they have in other aircraft of their fleet, instead the prefer having the Boeing’s recommended default white/grey color texture on the engines. Only exception being British Airways, where they’ve decided to go with Blue on the engines. But if you look at some other airlines, they all haven’t bothered to paint the engines but leave to plane white scheme. For example, Air India has got a lovely sunrise red and orange coat on the GE90’s of it’s B777 fleet but plane white on the 787’s. Now isn’t that too much cost cutting? A2. The engine manufacturer would prefer the airlines to display their company decals. It’s ultimately a decision for the people who determine the aircraft livery (paint scheme) and protect the brand. I am fortunate to own the A380 maquette (model) of the final Qantas A380 livery. It has every protrusion, antennae, decal. It’s a priceless and glorious piece of art. 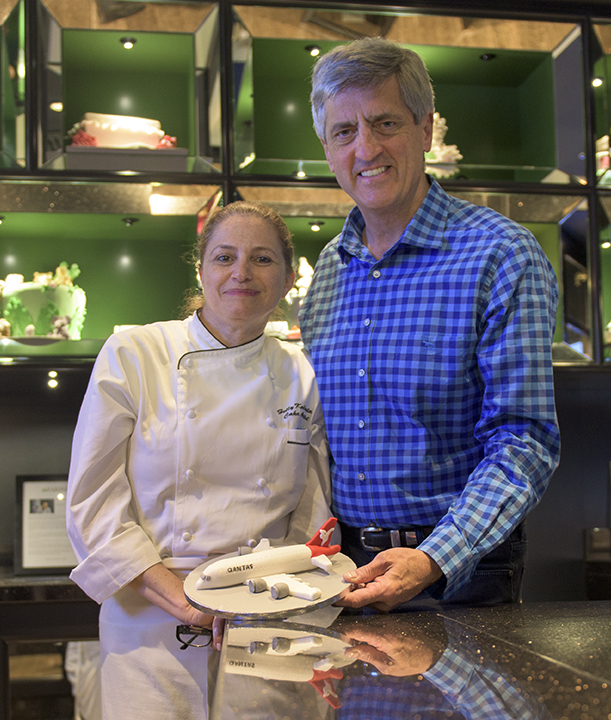 Thank you Gelly Kalouta and the Dubai Marriott Hotel for your scaled A380! I am very big fan of you. I’m from Dubai and what is wanting to ask you is how very often do you fly to Dubai? Do you like Dubai? Also why are the cabin crew discourage cockpit visit after landing saying excuse like pilots are busy or it is not allowed, is this true? I got that on a flight to London. They said the pilot’s are very busy, after landing? I very much like your blog and sorry as my english is little bad. I frequently fly to Dubai and love your city. The cabin crew in my airline DO NOT deny requests from well behaved passengers to visit the flight deck after the flight. The cabin crew pass the requests to the pilots and most pilots permit visits. I arrived into London from Dubai yesterday and it was our pleasure to show six passengers the flight deck after the flight. This practice is the result of our pilots having a genuine interest in our passengers’ interests and the need to give the best customer service. It’s all part of our attempts to make every passengers’ flight the best that they have ever had – to Make Their Day! I’d be pleased to show you our office! Sam Harris visits the A380 cockpit. I have two physics question I’m not sure about. 1) Why do airplanes prefer to takeoff and land into the wind? 2) What happens to the kinetic energy; K.E of an aircraft – when it decelerates down the runway after touchdown or landing? Is it conserved? Seasons greetings to you too, wherever you are! 1. The lift over an airfoil is proportional to the airspeed (over the wing) squared. Jet engines produce a relatively constant thrust during the takeoff roll and so the acceleration on the ground is relatively constant. So for small winds, a given fraction of (wind/takeoff airspeed) will give THE SAME FRACTIONIONAL change in the takeoff ground time. Differentiating the formula for distance, time and acceleration for time: “d = vt + (1/2)at squared”, shows that the distance varies with “2t”. The distance changes with TWO times the change in time. So for small winds, a given fraction of (wind/takeoff airspeed) will give TWO TIMES THE FRACTION SQUARED change in the takeoff distance. These rules do not apply to piston aircraft as piston aircraft produce a constant power during takeoff, not a constant thrust. Technical Question. What would happen if a pilot accidentally retracted the gears (wheels) in a parking/gate? Would the nose wheel or main gears collapse? In a majority of commercial aircraft cases, the hydraulics are strong enough to retract the landing gear (if the landing gear handle is raised) when the aircraft has weight on the landing gear on the ground. There is normally a physical barrier (that is moved by actuators responding to pressure switches on the oleo struts) that prevent the gear lever being moved to the retract position on the ground. In the case of many military aircraft, even with the gear lever in the up position, the gear will not retract until the gear is unweighted (during liftoff). There are cases where military pilots have moved the landing gear up at the start of the takeoff roll, and expected the gear to remain down until weight comes off the squat switches and the aircraft gets airborne, after which the gear automatically retracts. This reasoning has been proved poor many times. In one case a pilot tried this manoeuvre but came unstuck when the aircraft accelerated over a rise in the runway, the weight coming off the switches and then the gear retracting just as the aircrafts settled back onto the runway! I have two questions for you sir. 1) What aircraft’s have you flown before commanding the A380? 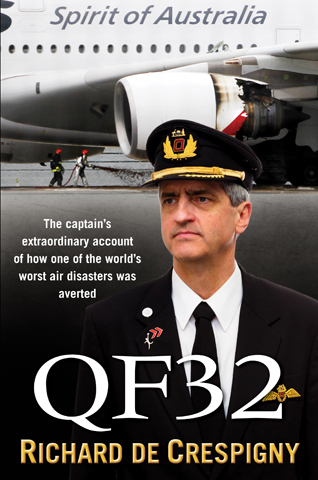 2) I haven’t watched the NatGeo Air Crash investigations on the QF32 yet, I’m still awaiting it on TV. The moment you realized on Qantas 32 that all engines were down, were you certain that the aircraft could make it back or was it a line of hope? 3) Relating to the “Miracle Landing” on Hudson river. Does the A380 have a better glide distance than an A320? The answers to your first two questions are in my book. The last Q. The A380 and A320 have finesse or Lift/Drag ratios or glide distance figures withing 10% of each other. Some people advise future pilots or student pilots to not consider taking a bachelors degree related to an aviation field but my mom says having an aerospace or mechanical engineering degree would be advantageous to some point in my career. There was this retired Delta pilot who said a degree related to an aviation field won’t help much, rather consider something in business management or economics. Is it true? It’s been some time that you haven’t given us an update as to when your new book “big jets” is expected to come out. I’m waiting for it eagerly. Thought I could get it as a christmas present for myself this year. How long is it near done? I am undertaking my A Levels in high school. I feel too tired and lazy to study sometimes. I am not getting enough sleep and I am getting low grades in tests. Do you have any study tips that you could offer? I would be grateful to you sir. Especially how to improve concentration, focus and memory (I procrastinate a lot). I cannot help you if you are lazy. Your parents cannot help you. The motivation and inspiration to work hard for what you want must come from within yourself. Self-motivation will be your guide. Click here for my comments about studying, memory and practice. Get up Arthur and get to work! Review photos on this website. I have included some of my best photos to inspire others to join this remarkable profession. Please contact me when your grades improve. Start to say you have one amazing blog and I love your book QF32. A technical question that’s kept me wondering.Months back, I flew on an Emirates A330 to a destination south of India, called Trivandrum. I’ve observed that pilots leave the flaps/slats at position (CONFIG 1) I believe; and they don’t retract it completely at all. Even after landing, you can still see the flaps out, at 1-position. When asked to Captain upon arrival he said it’s to prevent false bleed warnings where the OAT is >30C. I don’t get this. How come it doesn’t effect the Big Bus or any Boeing 777 jets? It’s been a while since I have flown the A330, and I do not remember any problems wit the bleed air duct. However Airbus aircraft use loop temperature sensors near the bleed ducts to detect (200 degree C) hot air to indicate a probable Duct Leak. There have been incidents on hot days with the slats retracted where the hot ducts heat the surrounding stagnant cavity air to a temperature that triggers an incorrect DUCT LEAK message. So to prevent the false Duct Leak messages, the slats are left extended to permit ventilation of the duct areas. This problem also exists on other Airbus types. I think Airbus is attempting to rectify the problem. I’ve noted on an Airbus A330, there’s something; a switch close to the anti-skid that says “Brake Fan”. What exactly is the purpose of this operation control and is it there on the A380 too? Plus..
How are the brakes on the A380 different from those on an A330? Airbus A330 and A380 aircraft can be optionally supplied with integrated brake cooling fans. These fans are mounted on the brake assemblies of each brake and thus increase the weight of the aircraft. Integrated brake fans blow ambient air through the brake assemblies. Integrated brake fans are used when the main gear is down and locked locked, the brakes are hot (> 500 deg C) and not before 5 minutes after touchdown. Integrated brake fans are recommended for A380 operations that include high energy landings followed by a rapid (< 1 hour) turnaround. No A380 operators have taken up the option for integrated brake fans because the weight (fuel) penalty over long sweet spot distances renders them less cost effective than the use of portable brake fans that are used at the passenger terminal. Brake assemblies are packs of rotors and stators much like multi plate motorcycle clutches. Brake disks are made of carbon that wear more as function of the number of brake applications than as a function of the energy they absorb (and temperature they reach). Here is a photo of the portable A380 brake fans that are used at Dubai. These "jet-venturi effect" fans are powered by 80 psi compressed air (much like passenger evacuation slides). These fans are VERY effective at cooling the A380's brakes that often reach 600 degrees after landing. These A380 main wheel tyres are 1.4 m high and 53 cm wide (approx 55 x 21 inches). The maximum A320, A330 and A380 brake temperature for takeoff is 300 degrees C. This limit ensures in the case of hydraulic fluid leakage, that any hydraulic fluid that comes into contact with the brake units will not auto-ignite. Click here to see the added risks and what can go wrong following a Maximum Energy Rejected Take Off (MERTO) certification test. Certification rules require that the aircraft must survive for five minutes (with hot brakes) unassisted, after which firefighters are permitted to spray the wheels and brakes with water to cool them. This test failed because incorrect fuse plugs were accidentally installed on the Airbus A340-600. This video gives more food for thought when assessing the dangers of evacuating aircraft. The brake temperatures on the QF32 flight exceeded 1,500 degrees C. The wheel axles on Nancy-Bird were heated to over 1,000 degrees C and had to be replaced. The high brake temperatures also melted the bitumen runway surface underneath the wheels. A scewdriver that was accidentally dropped penetrated 6 inches into the bitumen. The Singapore Airport services re-surfaced 100 metres of the runway in a two hours immediately before the runway opened for operations (8 pm). “On Intelligence” can be a reference valid for anyone interested in IA -or GOFAI (Good Old-Fashioned Artificial Intelligence) as some others call it- to explore what could be the real limits for a real I.A. in the future. By the way, a rapid conclusion is that one of these fields is piloting. It’s great to see so much motivation for this great passion, both on this website and in your book! I’m looking forward to the next one (big jets). From a very young age (about 1,5 years old according to my dad, also a commercial airline pilot) I knew I wanted to become a pilot and I managed to accomplish this goal. Starting as a S/O on the MD11 for KLM and later on transferring to the A330, right now I’m F/O on the Fokker 70. All in all, best thing ever! Unable to become an instructor as S/O I picked up a side study in psychology (always been a great interest for me). I’ve always seen instruction and training as a way to help people progress to the next level and this led to the founding of my own company in teaching/training and setting up training in Human Factors/CRM/Threat and Error Management. Right now I’m training ab-initio pilots that have been waiting for a job for a long time (3 years +). They are following a refreshment course that deals with most important ATPL knowledge and they do 2 sim flights. Airlines in Europe recruited 80% of the people completing this course, great stuff! One “problem” we come across, and people ask me about, is the lack of a good knowledge level stretching from basic knowledge to detailed aircraft spec’s, and what about that great tip you got from your colleague the other day? And of course, how do you safe, store and review all this. I always tell people: “Use a system that you’ll use, and is easy to maintain/update/review. Maybe you’ll have to try a few different things but make sure it’s a system that works for you.” Usually I’ll show them how I do it but that is my personal system tweaked for what works for me. You have referred to “Knowledge Management” a couple of times and that piqued my interest. What’s your view on this and I’m just curious how and what system you use. Keep up the great work and hopefully I’ll get the chance to see you speak sometime! Very few people understand the concepts of Knowledge Management (KM). To understand KM we must study the human mind and how it stores, links and processes memories to anticipate outcomes. Applications and web sites such as Google, Wikis, SharePoint and Confluence are not Knowledge Management Systems – they simply store, manage and search files. My passions in life are of aeroplanes, machines, science, neuroscience and computing. These are all technical fields requiring lots of information to be stored, cross referenced, qualified and recovered on demand. Many people aspire to use KM systems. Many people buy Customer Relationship Management (CRM) and KM systems, but 99% of these CRM and KM systems fail due to a lack of the skills and the dedication required to set up, populate them maintain the systems. It’s not just the quantity of data that is important. The key is to qualify and reduce lots of big data into electronic gold. To do this KM systems must manage the data, categorising it, storing references, qualifying the data, cross linking to other data, indexing, searching and rendering outputs in many forms. I have been paperless in knowledge since 1986 when I set up my first KM system using Microsoft Word. That did not work. I used the first Artificial Intelligence tools in the late 1980s, but discounted them all because they all worked in a serial manner, not like the parallel way the human mind works. I built my next KM system using the ForeHelp program in the mid 1990s. This system stored my life’s knowledge into the world’s smallest-fastest (Raima) database. All my knowledge is in these ForeHelp KM systems (I am typing these words into the KM now!). In the mid 2000s I output the aviation parts of my KM system as an HTML project, wrapped it into an Installshield Installation program and gave it to any pilot in my airline who wanted it. By the start of 2008 about 300 pilots subscribed to my KM system that I called “QUACK” (Qa…. Unauthorised Airbus Crossreference and Knowledgebase). I ceased distributing Quack when I started the A380 course as the referencing system provided by Airbus for the A380’s documentation system was fundamentally flawed. I made a suggestion to Airbus in 2008 to fix the flaw, and the solution came six years later in mid 2014 with the “DU Search” capability. So I am now able to stabilise my KM system for the A380 and resume using proper references to qualify Airbus data. I still use Quack for everything. All technical data for my book “QF32” was sourced from Quack. The only area that needed research was the subject of the aerodynamics of “Nancy-Bird’s” holed wing. Quack now consists of a single databases that publishes (in HTML output) to about 150MB of (single sourced) text in 2,300 files, 10,200 topics, 38,800 hyperlinks and 8,100 Index (keyword) entries. I can add data and then create crosslinks to other data in seconds. I can find any data and qualify it within seconds. That’s the good news. The bad new however reinforces my earlier statement, that so few embraced the concepts of KM that the extraordinary ForeFront company failed many years ago and ForeHelp program ceased to be available. A good KM system works in ways similar to the way the human mind works. Data and processes are single sourced. They tile and build upon themselves (like cascading XML style sheets) with zillions of cross links and hyperlinks. A good KM system is like the human brain that starts life as unprogrammed grey matter (storage) with no associations (white matter) and and then slowly builds intelligence and knowledge as the data sets (brain neurons) and hyperlinks (brain synapses) develop. With the help of a billion True North processors, Google and IBM might just be able to create thought and awareness in a machine by 2030. If I get the time, then I’d like to crowd fund a $10m project to build a proper KM system. I’d sit a “mind in a computer” software over the top of an unstructured database. However I might not have to. We have many more steps to take in our path to have a great KM. Good KM systems make knowledge accessible not just to the person who wants it but also to others (rendered in their individual contexts). When we tick this second box we will be many steps closer to being able to access unlimited knowledge just like the Borg in Star Trek. I’d be delighted to review any vendor’s KM product offerings! KM is an enormous field. Far too long to discuss fully here. Read “On Intelligence” by Jeff Hawkins if you want to learn more about the logic of the human mind. Ray Kurzweil also wrote an interesting book entitled “How to build a mind“. These books will help you extend your thoughts to the theory of KM. I will write more about KM in future blogs. Later, I hope then that I will be able to recommend a KM solution for the few dedicated people that have the discipline to set up, use and maintain it. I anticipate that scientists will produce sentient and thinking minds in computers within twenty years regardless of the risk that such a machine poses to humanity. History unfortunately shows that scientists have created technologies regardless of the consequences. I am unconvinced that Stephen’s use of the term “artificial” is appropriate. “Machine” might be a more appropriate term. Intelligence machines will have to initially learn and cultivate their knowledge in ways similar to humans. This knowledge will be real. The “minds” in thoughtful and sentient machines will have many features that surpass those found in human brains: speed, storage size, communications and sensor fusion. The knowledge, awareness, thoughtfulness and predictive skills in these machines will challenge humanity. What a great (and fast) answer! Very impressive! Neuro and cognition are 2 of my favorite directions in psychology. There is a vast amount of knowledge that is “need to know” for pilots and even more “nice to know” knowledge, sadly tho most basic knowledge gets lost over time. It’s still around in your brain somewhere but the “link” to it is lost because it was never used. The why and how questions are getting more and more rare in our culture it seems. Part of my goal with the company is to make people aware that the more complex, automated and reliable our aircraft become, the more important it is to review your knowledge because it gets used very rarely, and when the time comes that you need that certain piece of information you might not be able to retrieve it (especially not when stress, fatigue and time pressure are on you). For my studying I use a lot of mind-maps. On paper by hand and go, thing is that the space on paper is limited and it’s hard to crosslink to other mind-maps that contain extra or side knowledge to the topic. I’ve been trying out some digital mind-mapping software that saves in an online cloud, some of these even allow to add pictures and office files and lets you crosslink and “tag” tons of other things. Problem for me with this is that it’s a service offered by someone else, and mostly that if they decide to stop the support for a product. All my hard work and knowledge is stuck in that system and it would be almost impossible to transfer it to a new service because that will probably work differently. In the Airbus 320, next to the Landing Gear Lever there is an UP arrow and. DOWN arrow. Why is the DOWN arrow longer in length than the UP arrow? Good question Sabu. Airbus applies a consistent philosophy and “look and feel” across all aircraft types. So the long down “arrow” seen in an A320 cockpit is also seen in the A380’s cockpit. The UP arrow and DOWN arrows have a similar look. However the DOWN arrow is extended to double its length by the addition of a flashing warning arrow. The flashing warning arrow extends down well below the gear lever because the red flashing warning arrow must be visible to the pilot in the left hand seat (i.e. not hidden behind the landing gear lever) when the gear lever is in the DOWN position. The following photos were taken of the centre forward panel inside an A380 cockpit. So it’s this warning arrow that (when appended to the gear down arrow) makes the DOWN arrow look twice as long us the UP arrow. WARNING – TECHNICAL I agree with Airbus’ concept to use warning arrows to support ECAM checklists. However I have analysed many aircraft accidents and I believe that Airbus should take their philosophy one step further. I believe that Airbus should also install big amber caution lights surrounding the “Pitch Trim” switches, that illuminate when the software program logic in the flight control computers logic has degraded to Direct Law. These caution lights remind the pilots that they MUST use the “Pitch Trim” switches (that move the Trimmable Horizontal Stabilisers) to control the aircraft’s pitch attitude. A loud “DIRECT LAW! DIRECT LAW!” aural alert should also be sounded to trigger another human sense. Hey Captain, an aspiring pilot from Dubai here. Thank you for this wonderful website and blog. I’m looking forward to your new book “big jets”. You stand as an idol to me, and you are a very knowledgeable person both in ways from aviation background and technology, leadership skills and so on. Unlike the old days, pilots’ pay in the USA just keeps getting worse whereas the UK and the Middle East have the best pay; as much as what a surgeon in the USA is likely to make. A lot of people are discouraged by this fact and thus start doubting their choice of career path – “I should be a doctor instead, or join as an Engineer”. I’m strong in my decision to become a pilot, Skipper on the Big Bus (my favorite) as you are now! But a Pilot In Command of a major airline does hold great responsibly flying metal out of the sky and getting people safely across the globe. So what are your thoughts on this discriminated pay differences? Pilots’ salaries are much lower in the USA than in other developed countries. Take for example, the pilots of the Colgan Air 3407 crash in Buffalo of 12 Feb 2009. The First Officer on that flight was paid paid $23 an hour or $15,800 for her first year at Colgan and was making $16,254 per year at the time of the crash, probably a salary less than baggage handlers earned at that airline. She couldn’t afford to rent an apartment or get a hotel room in Newark where she was based, so she commuted across country from her parents’ home in Seattle. The average salary for its captains is about $55,000 pa.
Captain Sully Sullenberger called this an “untenable financial situation” for pilots and their families. Why are pilots paid so little in the United States of America? I don’t know the answer to your question but I do have a few thoughts. I welcome corrections and suggestions. I think there are many forces at play to pull pilot salaries down to their low levels in the USA. Chapter 11 of the United States Bankruptcy Code. This permits companies that are perhaps not “going concerns” to continue operations with the same management but to re-organise payments to creditors (suppliers and employees salaries & pensions). In countries that do not have Chapter 11 arrangements, these inefficient companies would be forced into bankruptcy proceedings that would attempt to ensure payments be made to creditors. I have many friends who are pilots in the USA who lost all of their pension funds and suffered a 40% wage reduction after their company restructured under the Chapter 11 provisions. The Chapter 11 codes are so attractive that airlines have entered Chapter 11 to enable these restructures. Too many airports. The USA has many more airports per capita than other countries. The extra airports create supply for additional (surplus) airlines, increased competition, thus lower yields, thus lower value add, thus lower air fares and thus lower salaries. I believe that the airline industry should pay a tax on empty aircraft seats on established routes as an incentive to curb the activities of surplus (inefficient) airlines that are wasting our valuable non-renewable energy sources (jet fuel). Superior USA lifestyle. Pilots accept lower salaries in the USA than abroad because they decide to remain domiciled in the USA. This is a lifestyle before income choice. Less collective bargaining in the USA. My impression is that USA pilots are members of many associations that negotiate and bargain salaries and benefits. These associations appear to compete unnecessarily with each other, fracturing and degrading the pilots’ influence. Pilots in other countries are covered by fewer and more coordinated organisations. Lower cost of living. The cost of living is lower in the USA than in many other countries. Cars, clothing, food and housing is much more affordable in the USA than other countries. Workers’ salaries in the USA are also lower than in many other countries. Perhaps the spread in salaries world-wide would narrow if the salaries were measured in units of buying power, in units of “Big Macs”, theater tickets or iPhones. Whenever I go to the airport I see pilots with angry faces after I smile at them. Fatema, I understand your observation because I see it as well. You would “make my day” if I chanced to see you and you smiled at me. I would always return your kind gesture. I see anger, sadness and disconnection not just in the eyes of some airline and airport staff, but also those in other industries whose job involves delivering customer service. Customer service is nurtured by the company culture, the things that we do when no one is watching. The culture is enshrined in the values and beliefs set by the leaders and managers. There are many reasons that airline staff might be unhappy. It is possible that you are meeting them at the end of their long shift that for pilots and cabin crew can extend to 20 hours! The pilot might have just landed after facing technical problems in the air, sick and violent passengers, a diversion, aborted landing, operations in bad weather with minimum fuel and then a challenging landing. The risk and stress peaks at the end of the flight when the pilots are most fatigued. The cabin attendant might have just finished working with difficult, drug and alcohol affected travellers, wiping vomit off seats and cleaning filthy toilets. If you are in the USA, it’s possible that you are observing fatigued freighter pilots whose schedules are not protected by law from fatigue to the same degree that passenger airline pilots are protected from fatigue. It is also possible that the workers are not supported by their leaders and management, that the management does not care for them, forcing the worker to put his/her survival before the customer’s interests. These might be the reasons, but never excuses for their bad behaviour. Commercial aviation pilots (with the exception of pilots in the USA) are rewarded for their skills and stress. If a customer is greeted with angry and unfriendly faces of people who have just commenced work, then I think that these employees have chosen the wrong job. The company’s culture and public image would be improved if these employees left the company. Pilots are privileged and honoured to command commercial aircraft. I spent fifteen years at school, university and in the air force developing my knowledge, experience and skills to become an airline pilot. These skills were very hard to acquire and maintain and so I still never take my responsibilities for granted. Passengers provide the money that pays airline staff salaries. For the value added airlines, passengers support the airlines that espouse the best culture. Fatema, if the angry and sad people you observe don’t share these philosophies,then they should not face customers. The pilots’ job is to “Make each and every passenger’s day”. This starts when we put on our uniforms. It involves being empathetic and respectful, and to serve and CARE for our passengers and co-workers. It continues in flight (keeping everyone informed, walking the cabin and talking to passengers). It continues even after the flight when we show passengers the flight deck, farewell them at the aircraft doors then help them (if required) at the baggage carousels. We remain “at work” from “Uniform On” until “Uniform Off”. Any worker who cares less than this is delivering their customers to their lower cost competitors and risking their company’s survival. Thanks for answering my question. Very interesting. I love it. Yeah I have seen these attitudes in many people here in Al Ain and also in Dubai. There are lots of these sorts of cars around. I think possibly I should have posted my question below to you in this Q&A section as it relates not specifically to the QF32 incident, but more of general info regarding aviation and weather. Being an aviation enthusiast I have read QF32, and have also delighted in some responses to questions from you in the past, thankyou. I am also extremely interested in learning and trying to understand the reasons behind aircraft accidents and incidents and do occasionally follow The Aviation Herald online. There have been a few incidents in the past published on this site in regard to the A380 and turbulence related injuries. Most of the time these are cabin crew injuries which one can assume occur as staff are not seated with belts on when the turbulence hits during cruise or descent. The latest being ‘Air France A388 near Leeds on Nov 4th 2014, turbulence injures three cabin crew’. How then does the A380 with all its power, responsiveness, technological advances and ‘Dance of the Ailerons’ (as explained in QF32) allow these accidents and incidents to occur? Are these due to extreme weather incidents that no aircraft would ever be able to blanket against, or certain airlines flying into conditions they should be avoiding? I realise each incident is different to the next and occurs at a different FL and set of weather circumstances, but in your opinion does it surprise you to hear of these incidents occurring considering the A380 is meant to be the most stable aircraft there is? I always keep my belt on regardless for this reason, but worry for the cabin crew who do put themselves at some risk for our care. Karina, flying an aircraft through air is like sailing a boat on the waves – there are smooth days and rough days. The A380 will ride turbulence better than most aircraft because of it’s inertia and fbw flight controls. Turbulence events still occur. If you sit with a seat belt on then you will be safe in any turbulence. I will write more about this is in a future book. I am interested in your opinion on the issue of cyber-hijacking. When MH370 disappeared, cyber-hijacking was one possible theory proposed for the plane’s disappearance. From memory, there was also a link to an aviation conference presentation where a delegate actually demonstrated how this could be done. Given the increased military tensions overseas, and the potential for would-be terrorists to find more sophisticated ways of targeting aircraft, I’m wondering if the cockpit software in our planes contains any security systems to protect against cyber-hijacking (particularly aircraft flying international routes)? I have previously discussed the topics and concepts you breached here with Boeing and Airbus engineers. I also had the privilege to open and attend the RAeS conference on “The Future of Flight Training Devices” in London last week. I am confident that Boeing and Airbus piloted aircraft are resilient (by design) to cyber attacks. However I would not be surprised to see demonstrations of successful cyber attacks in aircraft simulators, because of the inherent flaws in these reverse engineered and simplified structures. The A380 is one of the first networked and fully integrated aircraft in the sky. The A380 hosts many networks for the cabin, general aircraft and cockpit communications. Routers separate and protect these networks. Some networks are physically isolated to prevent external access from cyber attackers. Pilots check all uplinks before loading/accepting into the Flight Management Computers. I am not aware of the flight controls or FMCs of any FBW Airbus or Boeing aircraft ever being hacked in the last 50 years since the FBW flight of Concorde in 1969. To be clear, messages and flight plans sent from an external source do not have the privilege to auto-execute any changes in the Flight Management Computers (FMCs). The pilots still have have many methods to retain full flying control of an aircraft even in the worst and almost unthinkable case where a intruders hack the hardware-software inside the protected Flight Management or Navigation Computers. It would be almost impossible to hack into the Fly By Wire (FBW) flight control systems on Boeing and Airbus aircraft. Design and construction of these computers are not outsourced. Watchdog and Byzantine fault tolerance (inspired by the Byzantine Generals Problem) creates a mind boggling obstacle for a potential hacker. It should be relatively easy to demonstrate a successful cyber attack in some aircraft simulators. Be careful of any demonstrations of successful cyber attacks in aircraft simulators. It should be relatively easy to demonstrate a successful cyber attack in some aircraft simulators. In the cases where the simulators were attacked, I suspect that the simulators used were not simulators that use real aircraft parts and real licenced vendor software, but simulators that use cheaper reverse-engineered computers and software that are only designed to appear to do the same things as the real aircraft. Many simulator vendors reverse engineer aircraft hardware and software. This is a very expensive initial process, however once the data is compiled, this method saves 30-40% of the final cost for each simulator. Vendors reverse engineer the equipment generally without prior consent and so probably also face legal fees. The extraordinary costs involved to reverse-engineer software and hardware is only cost effective in cases where the simulator vendor has many customers. vendor updates require the entire and costly reverse-engineering process to be repeated from the start! Thank you for taking the time to reply to my question and alleviating my concerns on this issue. Much appreciated. Thanks again for signing my book while at the opening of the Clare Valley Aerodrome in South Australia. I wanted to ask, what was it like meeting Nancy Bird-Walton? I’m reading her biography now and she sounds amazing and certainly an inspiring women. Nancy was a short immaculately dressed woman. She was confident, knew what she wanted and was happy to tell you what she wanted – all hallmarks of a great pilot. I enjoyed reading Nancy’s biography. Like my father’s story, hers starts with a flight with Charles Kingsford Smith. What was missing is how she mentored other female pilots and offered an “open house” welcome to other female pilots that passed by. I also enjoyed documenting other stories of Nancy-Bird in my book “QF32”. Nancy was in every way as wonderful and remarkable as the other great aviators of the early 1900s. She rightly takes her place in the annals of aviation folklore. Qantas is privileged to have its first A380 named after this great legend. I am excited to fly Nancy-Bird’s A380. I tell the passengers they are flying in a remarkable aeroplane, and their excitement echoes my mood. QF32 book invites us to make a guess about where Situational Awareness exhibited by the captain comes from: different kind of planes and even helicopters, military and civil Aviation and different technology levels. I think the “hobby” related fields of mechanics and IT are important too. For example, that moment during QF32 when he decides that the information coming from the plane systems is not just incorrect, but must be disregarded. This is great thinking that we need to train in the minds of future pilots. However, I missed something in the book: The FO in the flight, Matt Hicks also exhibited excellent SA. I would be interested to learn Matt’s involvement from a CRM point of view. As with Capt de Crespigny, Matt could provide clues for future pilot training. Jose, QF32 was a team effort. A team win. Matt chose not to add to the commentary in my book and I respect his decision. I must agree that our airline pilots and crew are the most accommodating and driven in the world. QANTAS especially delivers on these values and it is very evident the professional and team culture that drives our national carrier. On the 18th November I flew OGL to Brisbane on business, but chose that particular flight so I could experience the 767 for the last time. The crew connected with my passion and not only accommodating but loved their job. Even after a technical issue during the flight the skipper was more than happy to have me up on the flight deck, shake my hand and let me sit in the right seat. The level of passion and professionalism I received would be unrivaled in any workforce. Well done QANTAS, and I may add this is not isolated to this particular service. Qantas has been looking after me as a passenger for decades. To everyone working for our airlines, keep up the fantastic work!